Ideal for posting any item that can be rolled eg. Posters, maps, prints etc. Also excellent for long/thin items. Below are our stock sizes, however Postal tubes can be manufactured to any size subject to a minimum order. Also available – coloured finish in matt or gloss subject to minimum order. Please contact us if you would like a quotation. Internal Diameter 50.8 mm (2") Wall thickness 1.5 mm Prices include plastic end caps for each end of the tube. 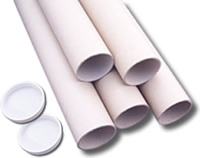 Internal Diameter 63.5 mm (2.5") Wall thickness 1.5 mm Prices include plastic end caps for each end of the tube. Internal Diameter 76.2 mm (3") Wall thickness 2.0 mm Prices include plastic end caps for each end of the tube.